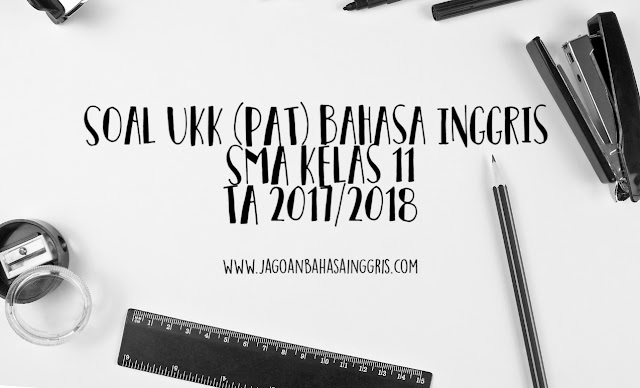 Tidak terasa akhir semester 2 sudah dekat, teman-teman semua pasti tidak sabar menunggu kenaikan kelas.Untuk mengatasi kecemasan kalian dalam menghadapi Ujian Kenaikan Kelas nanti kami ingin memberikan Soal Latihan UKK Bahasa Inggris SMA Kelas XI TA 2017/2018 agar teman-teman semua mendapatkan nilai yang bagus pada semester 2 ini. Untuk para guru juga, kami sangat senang jika artikel ini dapat membantu dalam pembuatan soal UKK di sekolah bapa dan ibu guru sekalian. Choose the correct answer by crossing a, b, c, d, or e! This text is for questions 1 to 4. Meanwhile, at home, their stepmother was beginning to wish she had never tried to get rid of the children. “I must find them,”she said and set off into the forest. They returned to their home and the stepmother became the best mother anyone could wish to have, and of course they lived happily ever after! 2. Which statement is TRUE about the stepmother? The underlined word can be replaced by the word…..
4. How did the witch die? This text is for questions 5 to 8. One day he went hunting into the forest. He intended to shoot any animal he saw. He brought his gun with him. When he was searching for his prey, suddenly he saw a bird perching on a branch of a tree. It was a dove, suddenly an ant came and bit his foot. He was so startled that he didn’t shoot the dove. It was safe and then flew away. Several days later, the dove was flying over a lake. He saw an ant floating on the surface of the water. It was the ant that had saved the dove’s life from hunter. The ant was almost drowned. The dove got idea, he picked up a big leaf and dropped it onto the surface of the water near the ant. Luckily, the ant could get on the leaf. 5. The main idea of paragraph 2 is that …. 6. The hunter was very …. when the ant bit his foot. This announcement is for questions 9 to 10. 1 kg of eggs only Rp2,500.00 and still more. So, get your shopping basket now. Have a nice shopping, thank you. 9. What is the announcement about? 10. When will the program end? 11. To give additional oxygen, ... is used in a home aquarium. 12. Which is not needed to stimulate a natural environment in a home aquarium? E. Keep the constant temperature for particular fish. 13. What is the above passage about? 17. How much Worcester sauce do you need to make creole onion soup? 18. Why should you warn your guests while having the soup? 19. Simmer for 3-4 hours. " What does 'simmer' mean? 20. April : "my brother has got a scholarship to continue his study in one of prominent university in America." 21. "Walk around with it and at least people will think you're cool." What does the word `it' refer to? a. A junky ol laptop. Woman : Your trousers are torn. What happened"
Boy : I fell from the bike, Mom. Woman : Did you get hurt? Boy : Thanks God I didn't. But I was very embarrassed. 22. Who are talking in the dialog? d. A mother and a son. e. A seller and a buyer. 23. What made the boy very embarrassed? a. He had fallen from a tree. b. His mother was angry at him. c. He had been beaten in a bike racing. d. His bike had hit a tree. e. His trousers were torn. 24. Man : Where is the English storybook? I really need it now. Woman : I saw it on Rina's table. Maybe she borrowed it. Man : She should have told me first. She really makes me mad. What makes the man angry? a. Rina has lost his book. b. Rina has torn his book. c. Rina has forgotten to bring his book. d. Rina has told a lie about his book. e. Rina has borrowed his book without his permission. 25. Girl : Huh, the long queue really makes me annoyed! b. It's none of my business. c. That's good for you. d. You must be disappointed. 26. Man : You must have forgotten to turn off the gas. Now, look! The house is on fire! a. The gas has made a great explosion. b. I am not sure I can do it well. c. It's really embarrassing that you could not do it well. d. I am sorry to hear that your house is on fire. e. It's not from our house. It's from our neighbor's. 27. Man : I am really ashamed of you. You were easily beaten in the game. Why is that? If you had practiced hard, it wouldn't have happened. a. Sorry, I promise it won't happen again. d. I know how you feel. b. It is none of my business. e. We can learn from it. 28. Girl : When I was having dinner, I spilt my coffee on the waiter's skirt. a. Let me check it. b. Let me help you clean it. d. What an embarrassing experience! 29. The boys have the photographer ... their picture. Silahkan download Soal UKK (PAT) Bahasa Inggris SMA Kelas 11 TA 2017/2018 dengan mengklik tautan yang ada di bawah ini yaa.